From Corey Rosenbloom: With the stellar rally in the market taking us to new all-time highs, what level appears as our Volume at Price pivot? Let’s update our chart – hint: it hasn’t changed – and take a look now. We’ve consistently seen the market print the 2,495 level as the “Volume Node” via our Volume Profile Chart for the S&P 500 (SPX). With the market screaming higher, it’s done so quickly without time to digest price or volume. This means we have an “Open Air” pocket beneath the market in the event we ever get a pullback (it feels like we never will). or price crashes through the rapid “sugar high” action on low accepted volume BACK toward a level of price and volume acceptance. 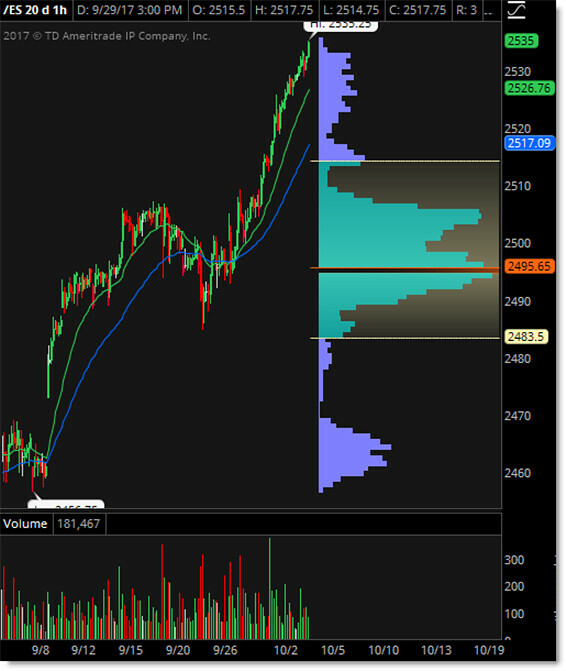 That level on the chart — as seen through the prior price consolidation and the Volume Profile — is the 2,495 level. Plan your trades accordingly and be safe. The iShares S&P 500 Index ETF (IVV) rose $0.12 (+0.05%) in premarket trading Thursday. Year-to-date, IVV has gained 14.31%. IVV currently has an ETF Daily News SMART Grade of A (Strong Buy), and is ranked #2 of 123 ETFs in the Large Cap Blend ETFs category.